Over the last several months, Steven Spielberg’s Ready Player One adaptation has been building itself an impressive cast. The movie is only a couple weeks from finally commencing principal photography, but there’s still at least one more actor joining the ensemble. It’s just been announced that Deadpool’s T.J. Miller has been recruited as the newest player in Oasis, the story’s expansive virtual reality world. As the latest addition to Ready Player One, Miller will play an annoying troll in the Oasis forums named i-R0k, according to The Hollywood Reporter. We won’t give any spoilers, but as you would expect from that description, i-R0k makes life hell for the main protagonist, Wade Watts. However, i-R0k wasn’t a major character in the book, so one wonders if his role in the movie will be expanded since Miller has been cast in the part rather than a less well-known actor. Anyone who’s seen T.J. Miller’s work knows that him playing an online troll is an excellent fit for Ready Player One. His snarky brand of humor is the perfect ammunition for hurling insults across the internet, or in the movie’s case, Oasis. If you need proof, just watch him brutally comment on Wade Wilson’s disfigured face in Deadpool, or check out that Shock Top ad that aired during the Super Bowl where he’s throwing back as the beer company’s orange mascot. He’s quite skilled with the verbal jabs. 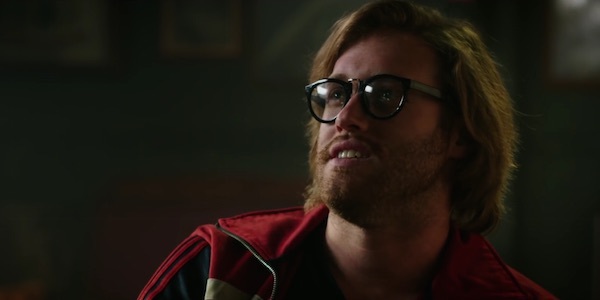 As mentioned earlier, T.J. Miller appeared earlier this year in Deadpool as Weasel, the Merc with the Mouth’s best friend, but he’s also well known for playing Erlich Bachman on the HBO series Silicon Valley. His other notable appearances include How to Train Your Dragon, Transformers: Age of Extinction, Big Hero 6 and Gravity Falls. Ready Player One is the latest blockbuster that will expose him to the masses. Set a few decades in the future, Ready Player One revolves around people around the world who play as virtual verison of themselves in Oasis to escape the troubles and dreariness of real life. X-Men: Apocalypse’s Tye Sheridan has been cast as main protagonist Wade Watts, who will finally stumble upon the first significant clue Oasis’ creator left behind that leads to a prize containing massive power and fortune for whoever can unlock it. The cast also includes Olivia Cooke as ally Samantha, Ben Mendelsohn as villain Nolan Sorrento, Mark Rylance as Oasis creator James Donovan Halliday and Simon Pegg as Holliday’s best friend/business partner Ogden Morrow.